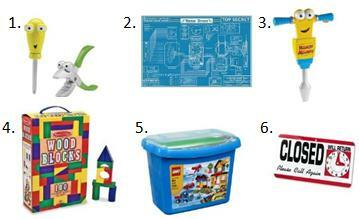 Do you have a junior handyman at home with a birthday coming up? 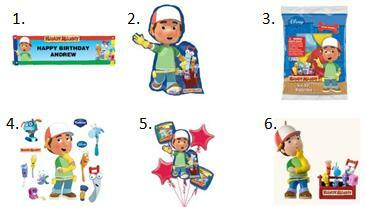 Here are some fun ideas for a Handy Manny birthday theme. Handy Manny is really popular in our house. We enjoy watching Manny and the tools on their latest adventures. I also enjoy the sarcastic humor of Turner – he’s my favorite! A Handy Manny birthday is so fun & easy to plan because of the show’s fantastic characters & settings. This party can incorporate some building, some problem solving, a little Spanish and of course a trip to Mr. Lopart’s candy store. Here you’ll find ideas for invitations, decor, food, activity ideas and treat bags. If you’ve watched Handy Manny, you’ll know that there is a little Spanish worked into every show. A fun idea would be to work a little Spanish into your invitations with words like Hola! (Hello), cumpleaños (birthday) and fiesta (party). If you are the crafty type, you could create an invitation in the shape of a red toolbox with pockets for paper tools that include the details of the party. For the rest of us non-crafty types, there are easy Handy Manny themed invitations that just need to have the party details filled in. Mr. Lopart’s Candy Store: You could set up a candy buffet area for the guests to fill candy treat bags. The candy treat bags could be sealed with Handy Manny stickers. Don’t forget Mr. Lopart’s cat Fluffy – you could place a grey stuffed toy cat on the table to welcome guests to Mr. Lopart’s Candy Store. Mrs. Portillo’s Bakery Shop: An area for the bakery could be set up with some traditional Mexican treats such as churros. Kelly’s Hardware Store: Kelly is a large part of each Handy Manny episode. She usually has all of the supplies that Manny and the tools need to complete their job. You could set up an area for the hardware store and use it for a building activity (I’ll provide a few ideas later in the activities section). This area could also have a few toys for the kids to play with like plastic tools and building blocks. 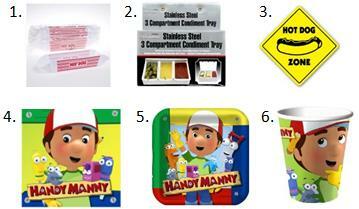 Other fun ideas for Handy Manny party decor are balloons, a themed banner, and wall decals. Manny and the tools are always receiving requests for repairs or to build things. 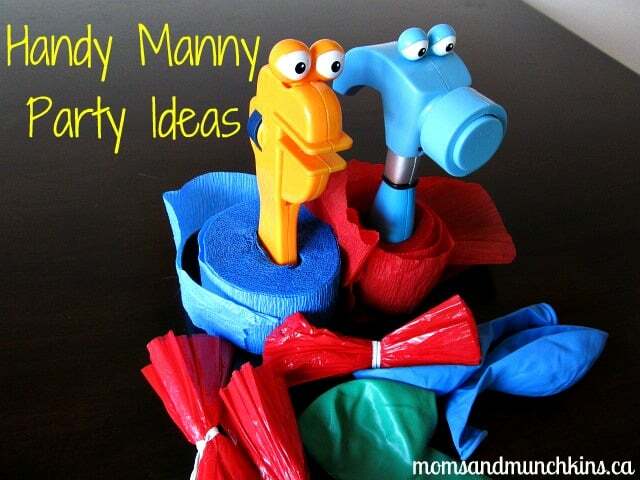 A fun activity idea for your Handy Manny birthday would be to give the guests a small building challenge. This one for a bird feeder looks like a lot of fun. You could let the guests know that the Mayor of Sheetrock Hills (Mayor Rosa) called Manny’s shop and requested some bird feeders for the park. Each guest could be given a small pail with their name on it (chalkboard labels are great for this) and a list of supplies they’ll need. 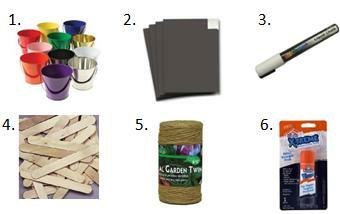 The guests can then visit Kelly’s Hardware Store to pick up all of the supplies they’ll need for their bird feeder assignment. At the end of this fun assignment, each guest will have a bird feeder they can take home with them. Another fun idea is a candy scavenger hunt. Mr. Lopart is always getting into accidents in and around his candy store. Before the party, hide a small dish of candy for the kids to find. Let the guests know that Mr. Lopart created some fabulous new flavor of gumdrops but has misplaced them and he needs their help to find the candy. The first child to find the hidden candy can win a prize (which could be the dish of gumdrops). For an easy but popular food choice, you could serve hot dogs from Luigi’s Hot Dog Stand. Luigi has a bike & cart hot dog stand that he sets up in the local park. Another themed option is burgers and fries from Fast Eddie’s Diner. Handy Manny themed napkins, plates and cups are a great way to work the party theme into the food area. Cake, cupcakes and cake pops are all popular options at birthday parties. A fun idea for cake pops would be to set them up in a toolbox used as a serving tray. A red toolbox filled with cake pops would make a great centerpiece on the table. 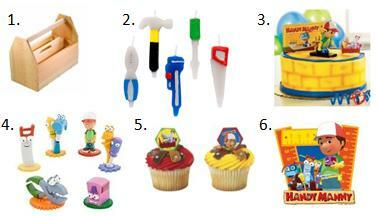 If you prefer cupcakes or cake, there are plenty of Handy Manny cake toppers and edible decorations to choose from. The dessert table could also include a few treats from Mrs. Portillo’s Bakery. 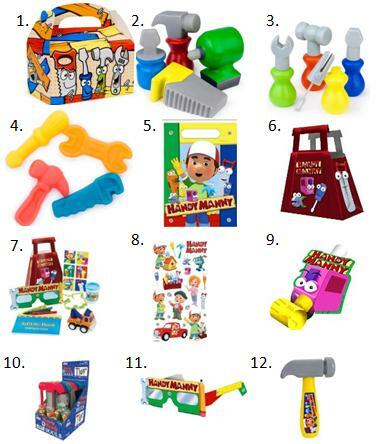 There are so many fun options for treat bags for a Handy Manny birthday such as toy tools, inflatable tools, candy tools, stickers and much more. If you’ll be doing a building activity with the kids, they can also take home their creations as part of their treat bag. Who is your favorite Handy Manny character? We always love a good party! We’re adding new party ideas all the time here on Moms & Munchkins. Stay updated on the latest ideas by following along on Facebook, Twitter, Pinterest and Bloglovin’. **Disclosure: I am part of the Birthday in a Box and Amazon affiliate programs. All of the opinions expressed here are 100% my own. My little ones would LOVE this as their party theme. Handy Mandy is a favorite in our house! I really like all the things you can purchase, making it unique to each child if you want- I think kids prefer to have something a little different than the others, especially the B-day boy or girl. Yes, kids love little unique touches in their birthday celebrations. It’s great to be able to plan things special for each child.